Menu Planning, Inspiration and My Family – What's for Dinner Moms? I have had a couple of people ask questions about my blog recently so I figured it was time to do a blog post about my blog. I am a mom. I am probably very much like most of the parents that may read this blog. I am busy volunteering in my son’s school, driving my daughter to dance lessons 3-4 days a week, carting my son and his cello to lessons and orchestra rehearsals and a thousand other things during the week. My partner works for a large corporation and has unpredictable hours most days. So, we eat dinner later than most families – usually around 8:00 pm. About 4 years ago my family was stuck in a rut. Well, I was stuck in a rut. I didn’t want to cook at all. My family wanted beige food all the time – spaghetti, chicken nuggets, French fries and pizza. I was a child who never ate vegetables. The closest I would come was corn or potatoes (which are not really vegetables). I didn’t want my kids growing up to be the picky eater that I was. Something had to change. I started a game with my kids on Chinese New Year. I would make a different meal each night and we would take a picture of it and post it, no matter what it was. The first two years were rough and we hit our target about 35-40% percent of the time. But by the third year we hit our groove. We tweaked the game a bit to be having a new meal each weeknight (so we could repeat favorite dishes on weekends and birthdays) and we are now about 90-95% of the time having different meals each night. I am not a chef. Never had any training other than standing next to my mother in the kitchen. But, I have learned so much since we started this game. I do meal plan for a month. If I don’t meal plan everything falls apart because I am trying to figure out what to make as the kids are complaining they are hungry. I am all about saving time AND money. If I know what our schedule is I can plan to have a slow cooker soup or casserole on days when we will be out of the house most of the day. Or I can plan on making two meals one night when I have a bit more time to have in the refrigerator for the next night or pop in the freezer for another busy day. This keeps me from running through drive thrus on the way home. I cannot tell you the last time we went to a McDonald’s. Inspirations for dinners come from restaurant menus (I have been known to snap a picture or two of menus), Pinterest, magazines and classic cookbooks. I especially love old-fashioned cookbooks. The older the better! So, I basically snap quick pictures of the food I make for my family each day. I don’t have a fancy camera, back drops and lighting. This is REAL. Most likely it is my plate you will see. Yes, you will see paper plates too. I am a mom. I am going to tell you when things go bad – they do (too often!) and when they go well. I hope to inspire others to try to leave fast food behind, sit down at the table with their families and connect with each other. Tomorrow I will answer some of the questions on how I got my kids to become fearless eaters (well, most of the time). I can’t pass up a cookbook. I love to cook internatial food specialities and I spend hours on our meal plan. Making healthy versions of dishes we love it a hobby now. I collect them all. I have about 50 ranging from the 1920s to today. My favorite is one my grandmother wrote church dinner recipes in by hand – 50 lbs. potatoes, 5 lbs diced onions….. Thank you, that means so much to me. Nice never seen anyone write out a meal plan!! 🙂 Thank you so very much! Have a great weekend! Yes! Also a maid, chauffeur and personal assistant! Inspiring! Love it. Used to do the whole meal plan thing when I was married or had a roommate. One day I had off work and cooked a “real Southern meal” (my comfort food) and my roommate was like “If I knew you cooked like this, you’d been cooking everyday since we’ve lived together!” (That was a year in to our roommate situation.) Living by myself I don’t do that anymore. I basically stand in my kitchen and combine flavors of things that are in there…or resort to my go to food – a peanut butter sandwich. Have loved reading and seeing your posts since I’ve begun following you. 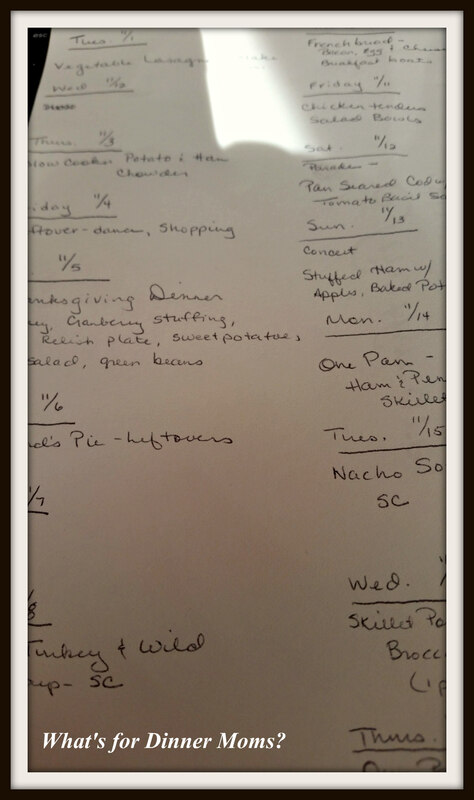 I think that is awesome how you are going about planning meals everyday. And you are right about leaving the fast food behind. What happen to sitting together at mealtime as a family talking to each other? Without the cellphones. Mealtime is our 2nd favorite time of day together. We talk about life, sports, politics and of course Disney World. Our favorite time of day is reading together at the end of the day. I love these times! Yes. My daughter is dancing at Oreichtas (Irish dance regional competition) which is held over Thanksgiving weekend. There was no way I could have dinner cooked and put away before leaving. So, we just finished our relaxing Thanksgiving dinner and on actual Thanksgiving we will have a few appetizers and play some family games. Very nice recipes. The chicken pie is so easy I may have to give it a try. Wow! I have never gotten the hang of meal planning. I might have to give it a try again. Enjoyed this post greatly. My suggestion would be to start small with 2-3 days at a time. It is not overwhelming then. Also you can pretty much know what you have on hand and easily plan meals. I think that has been my problem in the past, I try to plan a whole month at once. Great tip. Starting small might be the key.